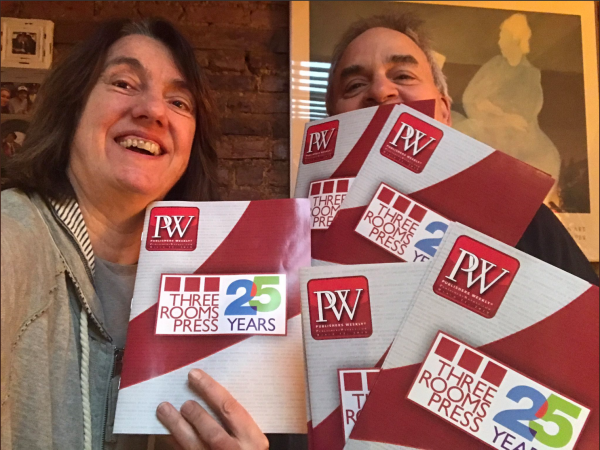 To kick off our 25th year, 3RP was honored to be featured on the cover of Publisher’s Weekly! Twenty-five years ago, Three Rooms Press started up as a publisher in San Francisco, with a commitment to introducing extraordinary literature to the world. Our initial focus was on poetry: lovingly hand-assembled chapbooks documenting some of the best of the 1990s San Francisco underground poetry scene. Relocating to New York City (Greenwich Village) in 2003, we expanded our scope to include literary fiction (including mystery/noir and science fiction), creative historical fiction, biography/memoir, plus literary young adult, along with our annual journal of contemporary dada writing and art. As we celebrate, we are grateful for the creators we have worked with: the writers, artists, editors, designers, printers, and digital mavens worldwide. We also appreciate the literary agents who connect us with creators, and continue to advise us on new and established diverse voices with unique vision and stimulating stories. We would especially like to thank our amazing distributors, PGW/Ingram, for getting our titles out into the world. Many thanks as well to the many hardworking bookstore owners, booksellers, librarians, book clubs, and teachers, who help us so much with their support of our work. And, of course, giant thanks to the reviewers, journals, and associations who get the word out about all great literature, including ours. And readers? You make it all worthwhile. We are happy you are a part of our 25th anniversary year and thrilled to be launching it with our ongoing commitment to high-quality, meaningful writing. As we continue to grow, we look forward to strengthening our relationship with everyone in the publishing world, so that we can share our greatest goal: contributing knowledge, beauty, and inspiration to the world. At the core, that’s what makes publishing worth all that effort. To make a difference. We’re thrilled to be sharing our 25th year with you. Stay tuned for fun project, and keep yours ears open for exciting news coming in October 2019!